Open Vision™ Grind was developed to provide the best of both worlds - the features and performance grinding customers demand with the reliability and acceptability of FANUC commercial control systems. The software simplifies the grinding process for CNC machines like Universal, ID, OD, Vertical, Surface, Race, Bore, Roll, Step, Thread and Creep Feed grinders. Open Vision™ Grind uses the same interface, regardless of the grinding machine configuration, so operators can easily move between grinders. The built-in conversational programmer provides a quick and easy solution for developing complex grinding programs. Editing tools allow users to create new programs from scratch or copy existing programs and edit inputs to easily build a large database of part specific programs and greatly reduce changeover times. Open Vision™ Grind Programmer can be accessed via the HMI PC and/or a desktop PC. Open Vision™ Grind sets the industry standard for operator friendliness. Visit our Image Gallery to learn more. A grind specific run screen has been developed providing operator information specific to the part program(s) being executed. The screen has been designed specifically for the grinding environment. 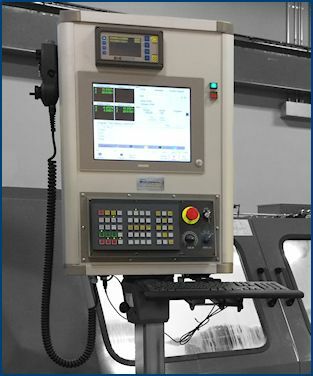 Machine position displays can be configured as required; wheel, work and dresser spindle speeds and loads are displayed based on the specific machine configuration. Visual as well as descriptive cycle progression is provided through out the cycle. Example of accessing an alternate configuration of the standard run screen, we display and interface to both discrete and analog gage platforms. The software allows integration with a variety of Gage Manufacturer’s software packages (Gage HMI) that run on the Industrial PC provided on each system. This allows the elimination of interface hardware that is typically pendant mounted. This has been done on gauging, wheel balancing, flagging device as well as AE sensor control hardware. By highlighting the surface or operation you wish to skip setting the machine up to do regrinding takes seconds. Once complete touch the surface again and you are back to the original program, this feature is configurable allowing your operators as much flexibility as you wish. A notes pad has been implemented within the grind software package; within each part program information can be transferred for setup ease or just reminders to ease in the change over process. Allows data base access, this window is where all program information is developed and stored, the copy and paste feature within the control allows ease of program setup/development once a part family or default settings have been developed. 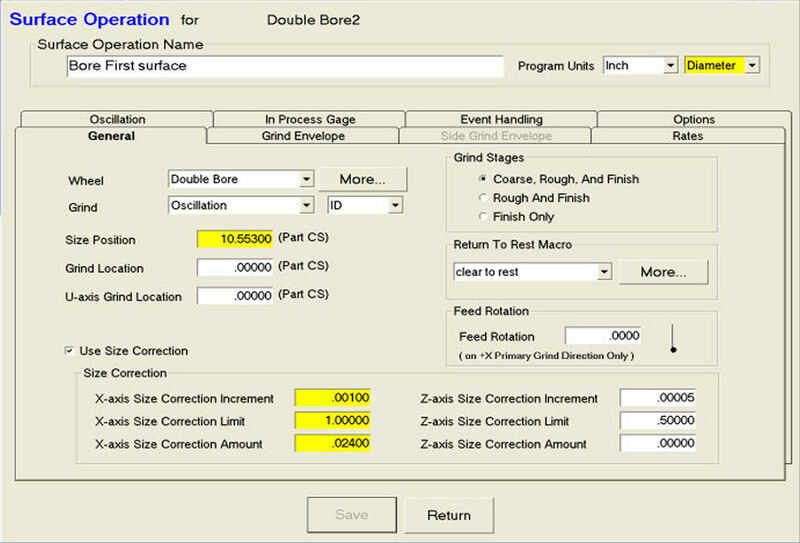 Tab that allows the setup of all feed rates for each part program; notice the color coding (yellow) for all data that is sensitive to the diameter/radius setting within the software. Open Vision Grind allows the changing of diameter/radius programming as well as inch/metric display of all positions and data. Visual display of each grind surface with descriptive aids for entering grind specific data. Each wheel type has a unique data base created and allows tracking of diameter, face and back face information. This method of tracking allows easy change of wheel types as well as a method to compare wheel information against the spindle specific parameters and never allow an unsafe condition to occur. Mini Cad package has been developed to allow ease in programming of all dress configurations required for your applications. There is no limit to the segments programmed and various options of entering data have been provided. Radius, Crown, line or angle programming are all supported. This same programming format is provided to support Contour Grinding as well! Devices are configured per the application and we allow them to be easily integrated within the part program they are inserted and than are linked to the grind surfaces as required. Devices consist of loaders, dressing systems, gage interfaces and other auxiliary equipment that may be interfaced to your grinding machine. We allow the programmer to customize his cycles per the application, we provide a list of available events and they can elect to use or not use them per part program. We also add another level of flexibility, multiple actions per selection is integrated providing total cycle flexibility. The programmer determines where these events occur in the cycle by entering feed points (distance from size). Setup screen that is used to show the relative position of the dressing tools in relationship to the wheel(s) this allows the software to make the necessary calculations for dresser related offsets. The software supports multiple dressing devices to be mounted within the machine envelope. They can be selected and used as needed per the part program requirements. With every system provided we supply an offline programming package that runs on a Windows based PC, the screen displayed allows a programmer to import/export a variety of information to one or multiple machines. Examples include part programs, wheel information, dresser information, etc. Allows the offline programming package be configured for each machine type supported, this section allows features that are needed to be enabled/disabled. This minimizes operator interface and eliminates the need for reviewing/answering questions that are not related or relevant to the process running. We provide a number of debug and process monitoring options to be utilized with each package such as a cycle logging. If cycle logging is enabled in the background we time stamp the total cycle time and break out each step with its own associated times and put the information in a data base that can be retrieved and compared to existing data. We have a built in debugger utility that is used to assist in trouble shooting; the information can be exported to the screen or an external file. 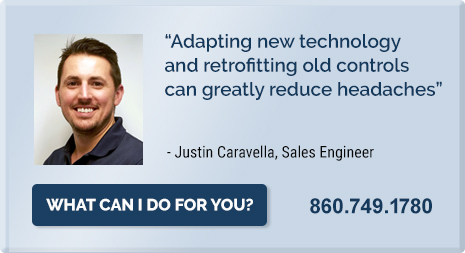 Within each system we provide a configurable Preventative Maintenance scheduler that can be configured as desired. Each event is programmed to allow notice to be provided so many days ahead of the event and allows an override (number of days) be programmed as well. The information can be displayed on the screen or networked to others such as the maintenance department.